Equine assisted coaching is a form of therapy using horses to help promote emotional growth. Horses can respond immediately to our behaviors and give feedback to our actions. They are also able to mirror our emotions. Because horses behave like we do in their social and responsive behavior, it is easy for us to establish connections with horses and gain insight into ourselves and others in the process. 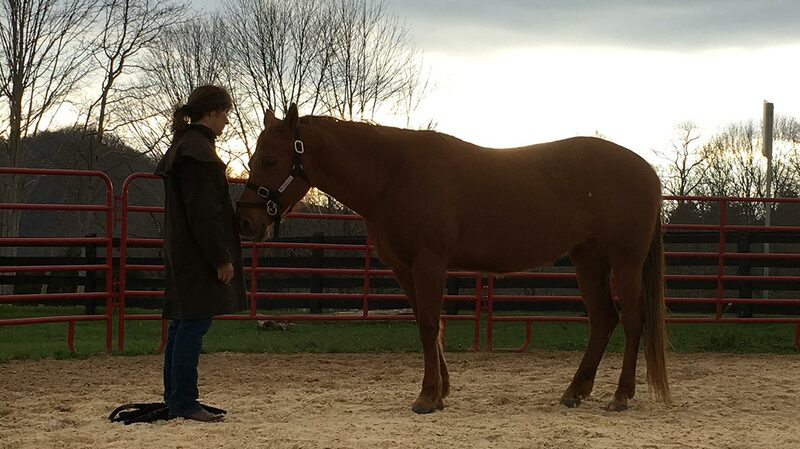 At Blue Ray of Hope, equine assisted coaching is a key aspect of our approach to achieving holistic health and wellbeing, where we combine the restorative beauty of the West Virginia countryside with proven equestrian therapy techniques. At Blue Ray of Hope, our goal is to build hope and create joy where it has been lacking or lost. We work with those who are on the journey to learning how to embrace life and live fully, now and into the future. Equine assisted coaching helps the individual, the family, and the community overcome obstacles that prevent us all from moving forward. Sometimes, we simply lose sight of our inner strength due to an ocean of fears, trauma, and pain. For many, a horse provides the bridge over that ocean and reconnects us to our true selves capable of reaching our full potential. While working with horses under the guidance and supervision of an equine coach, you also have a unique and effective opportunity to identify behavior patterns, process thoughts and emotions, and note any tendency to engage in self-defeating and otherwise negative thoughts and actions. These realizations provide excellent bases for discussion and processing both during and after the equine assisted coaching experience.